Mule deer are brownish-gray in color, have a white rump patch, and a small white tail with a black tip. Mule deer (Odocoileus hemionus) are distributed throughout western North America from the coastal islands of Alaska, down the West Coast to southern Baja Mexico and from the northern border of the Mexican state of Zacatecas, up through the Great Plains to the Canadian provinces of Saskatchewan, Alberta, British Columbia and the southern Yukon Territory. Generally, mule deer are quite easy to identify, due to their large mule-like ears, for which they earn their name. They usually have a distinctive black forehead, or mask, that contrasts sharply with a light gray face. The lighter facial coloration makes the eye rings and muzzle markings seem less obvious. 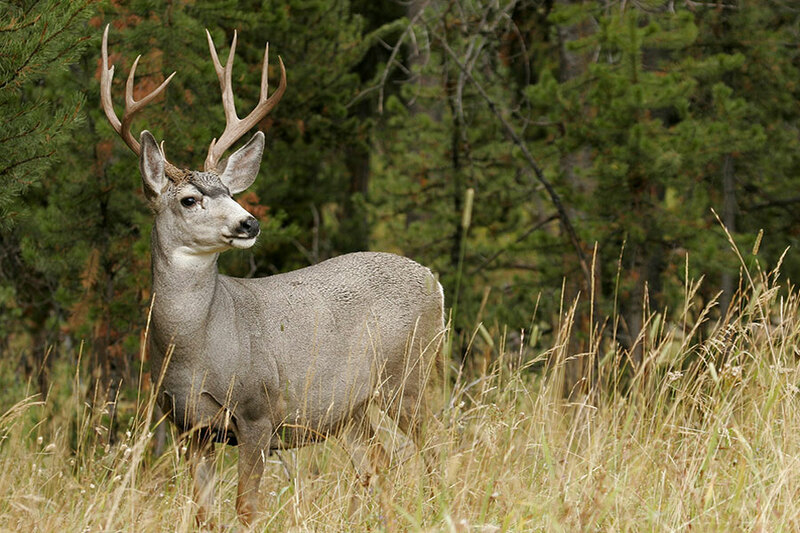 Mule deer are brownish-gray in color, have a white rump patch, and a small white tail with a black tip. Mule deer are primarily browsers, with a majority of their diet being comprised of weeds, leaves, berries, grass, and twigs of woody shrubs. Mule deer are generally larger than white-tailed deer, typically weighing between 100 and 300lbs, depending on its gender, season, region, age, and access to food.